FRONTOSA CICHLID - What You Need to Know About This Species! Frontosa cichlid is incredibly magnificent and docile fish that would swim around the tank peacefully unless intimidated. They have this blue or white body accented with black bands that run vertically along the body. However, frontosa are more copious in blue color. They have the ability to grow quite largely about a foot or so in length when mature and with the right and proper water conditions and care will optimize life span of 25 years. So much more this variety is complaisant to other tank mates as long as they are provided with capacious room for all the cichlids to swim but may tend to be territorial and will act aggressively towards any fish that will tempt to enter their domain. It is also best to take note that this cichlid will grow huge and agile when threatened therefore it is not good to use rocks with sharp edges as an aquarium dcor or anything that may injure them must be taken out. An appropriate aquarium size would be 75 to 100 gallons in size though a larger tank is better. Choose a longer tank and not the deep sized aquarium. The substrate may be sand or fine gravel and incorporated with caves that can be used for hiding. The pH level should be kept at 8 and maintained with a consistent temperature of 75 and 80 degrees Fahrenheit. Frontosa cichlids feed mainly on small fishes in the wild, so they will definitely thrive with a feeder fish occasionally. Although they can also be fed with live or frozen krill, Mysis, shrimp, and worms. Fry's enjoys pellets and flakes but once they reach about 5 inches in length and as they mature tend to refuse foods like flakes. They are generally compatible with most other fish variety of the same size and are classified as semi-aggressive cichlid. But be careful not to place them with smaller fish, they are in danger of being eaten. Lake Tanganyikan, Clown loaches, and larger plecos are your best choice. They are slow growing fish and will take at least three years for them to fully mature and get ready to breed. His color is the full determinant that your cichlid is ready to breed; they usually exhibit a vividly blue tone color while the female egg tube will start to protrude when she is ready to spawn. When ready for breeding, the best ratio is to have four females to one male. In this way, it will aid in optimizing the success of breeding. Primarily, the male will choose a location in the tank where he can release his sperm most likely in a cave, and at the same time the female is right behind him and ready to release her egg into the sperm. When the eggs are totally out that is about 50, the female cichlid will then scoop them up into her mouth for incubation. 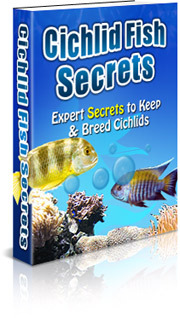 Find out more on how to breed frontosa cichlid, get to see how amazing it is to breed and raise them in as much as keep them in aquariums.